Difficulty: (YDS) class 3 - French Alpine: F+. From Seattle, go north on I-5, exit east on Hwy. 530 to Arlington and Drive through Darrington, at the far end Hwy. 530 turns sharply left while Mountain Loop Hwy. goes right. There is a stop sign here and a small burger restaurant slightly left. A gas station is also located across the street. Measure from this intersection. Turn right at the stop sign onto Mountain Loop Road and follow this road (go straight at mile 8.9), at mile 9.0, the pavement ends, but the road continues as a well maintained dirtroad (suitable for all cars). At mile 15.9, turn left onto forest road 49 (Norh Fork Sauk Road). At mile 22.4, fork left, then park at the trailhead at mile 22.6. A forest pass parking permit is required, I bought an annual pass for dollar 30 at the Seattle REI store. This is the trailhead, location N48:03.474, E121:17.299, elevation approximately 630 meter. The fact that a different and shorter approach existed before 2003 may be one of the reasons for several, somewhat confusing descriptions of this route. We followed a route that works very well and that should be easy to use also for future parties. 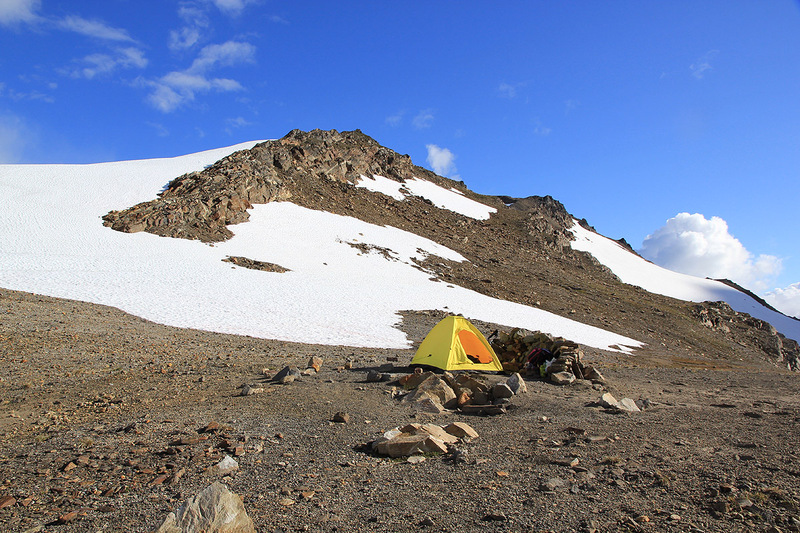 Shortly after the shelter, the trail starts climbing and after another 4.5 kilometer you have gained more than 900 vertical meter and reach the Pacific Crest Trail (PCT), at location N48:02.195, E121:09.174, elevation about 1812 meter. 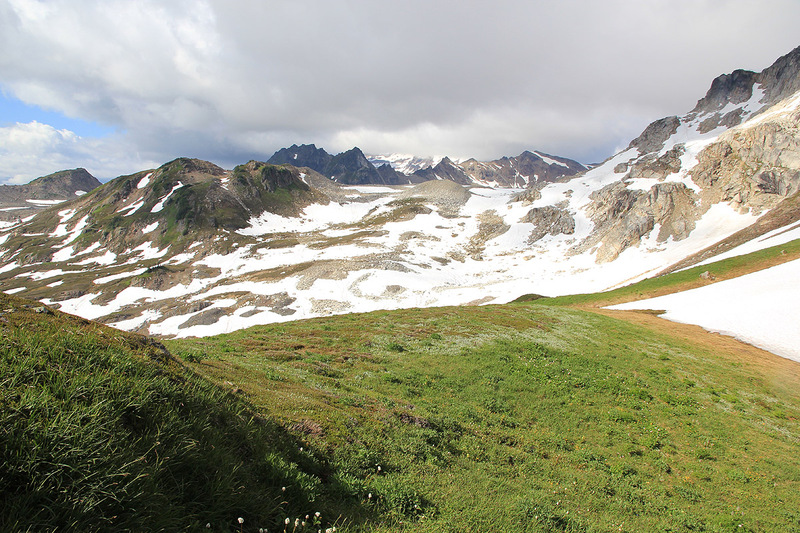 Continue along the PCT (turn right, east) as this trail traverses the slope below White Mountain (2147m), staying slightly above 1800 meter on its way to White Pass. 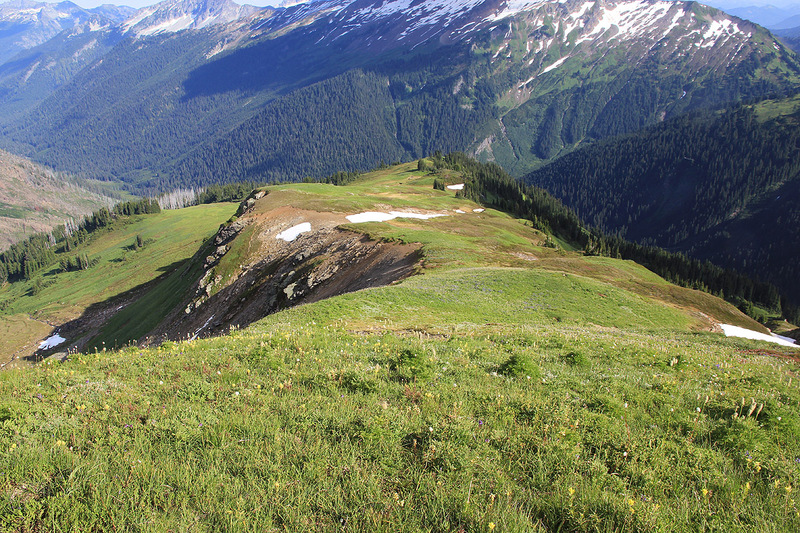 Before White Pass, as soon as the PCT reaches the (south) ridgeline from White Mountain, locate a trail that forks left. This fork is at location N48:02.081, E121:08.936, elevation about 1812 meter. This trail is not marked on the topo maps available in 2010. 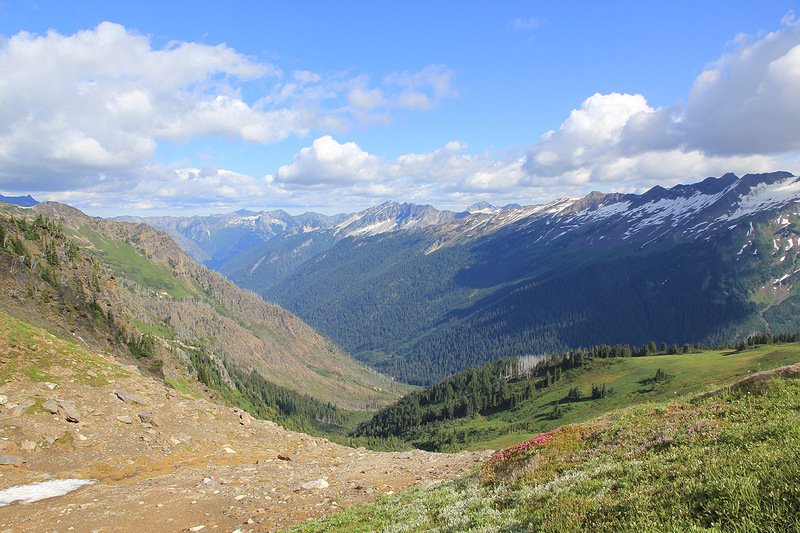 Thus, the route follows the PCT approximately 800 meter. 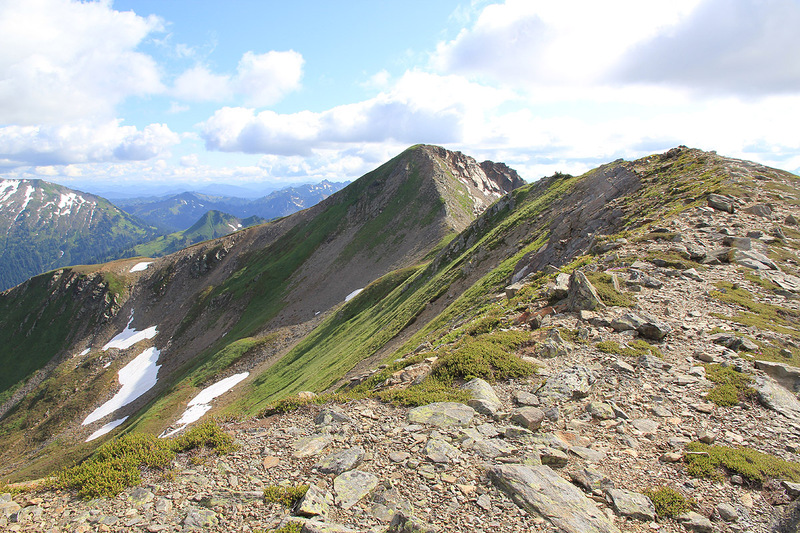 Follow this (new) trail about 2 kilometer, until it runs out (ends) on the south-east ridge from the summit marked as point 6770 (that is 2063 m). 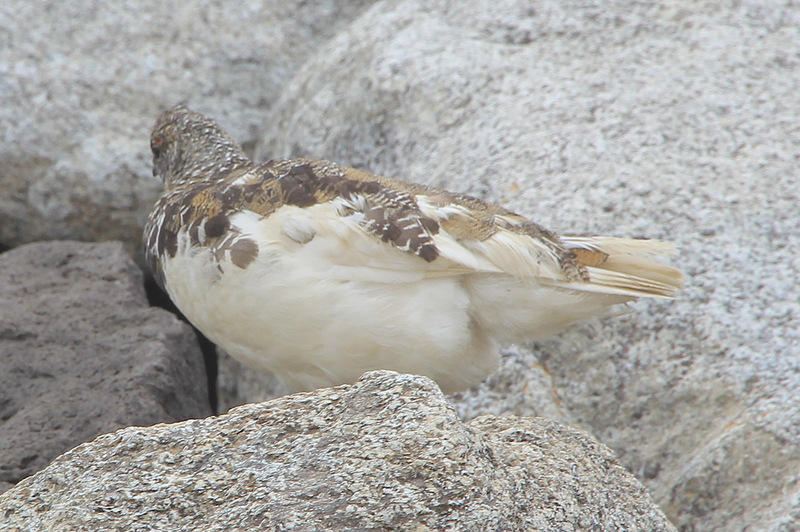 You should now be at location N48:02.501, E121:07.649, elevation approximately 1925 meter (6316 feet). This is a good place for a camp with water nearby. 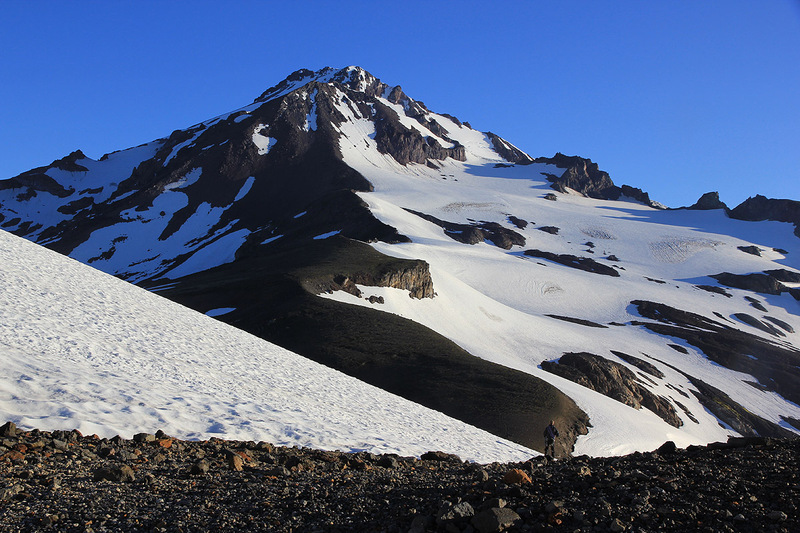 Turn 90 degrees left and follow a climbers trail directly up to the summit at 2063 meter. This trail may be a bit difficult to see, it generally runs near the right hand side (NE) of the ridge. 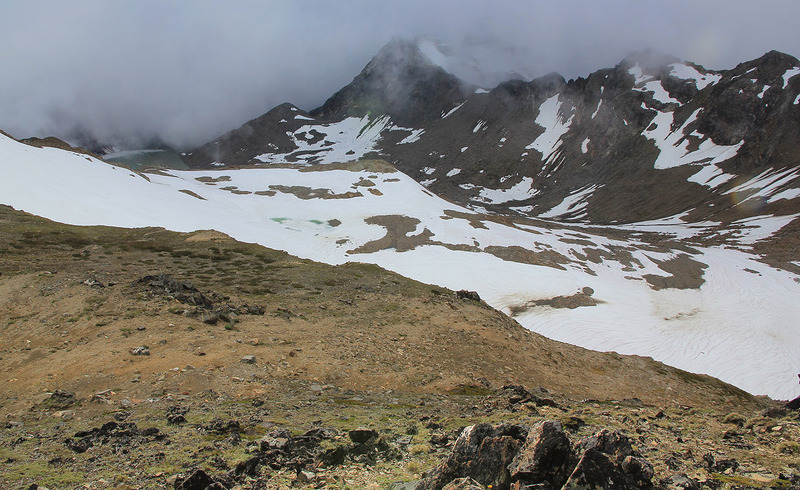 The route has been generally (YDS) class 1 to this summit, however the continuation requires some low class 3 scrambling as you descend (north) along the ridge to the distinct saddle below. Continue along the ridge, first by a very easy (short) ascent to the next local summit. 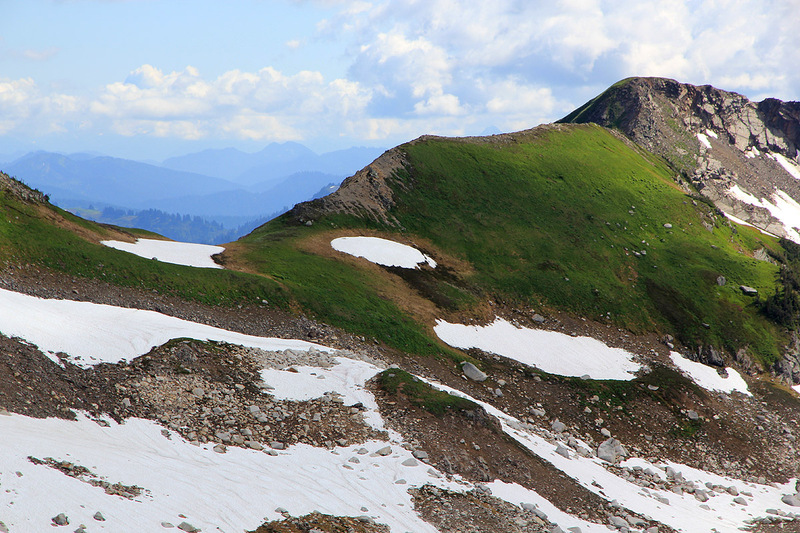 This summit has a clear trail running along its top and subsequently descending to a new saddle. 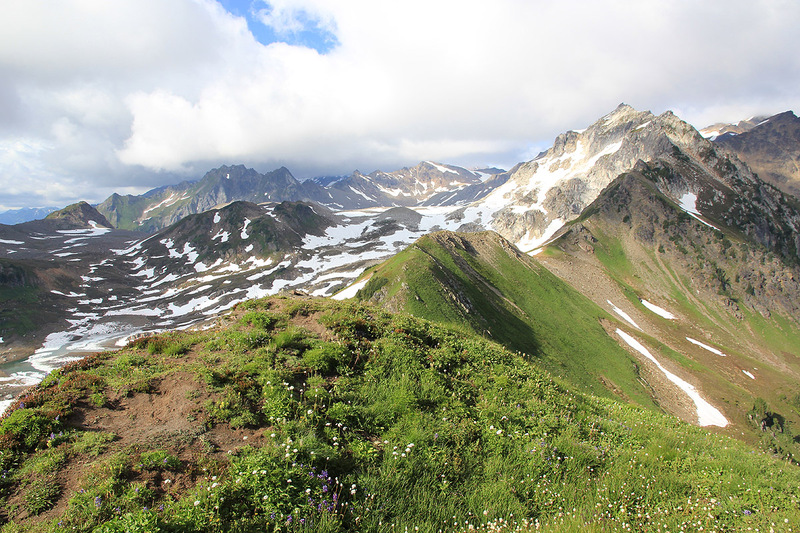 The slope going north is now quite gentle and you may be able to continue along a small climbers trail as you leave the ridge at this point and head for a shallow valley going north on the right side of a small moraine summit. (The previous picture shows the ridge traverse when looking back. You see (from the back towards the front) the first peak, the first col, then the flat top of the lower green peak, finally the second col having a bit of snow, this is where you leave the ridge.) That is, from the second saddle on the ridge, the route should head north, first descending about 70 meter (230 feet), then ascending while heading north. 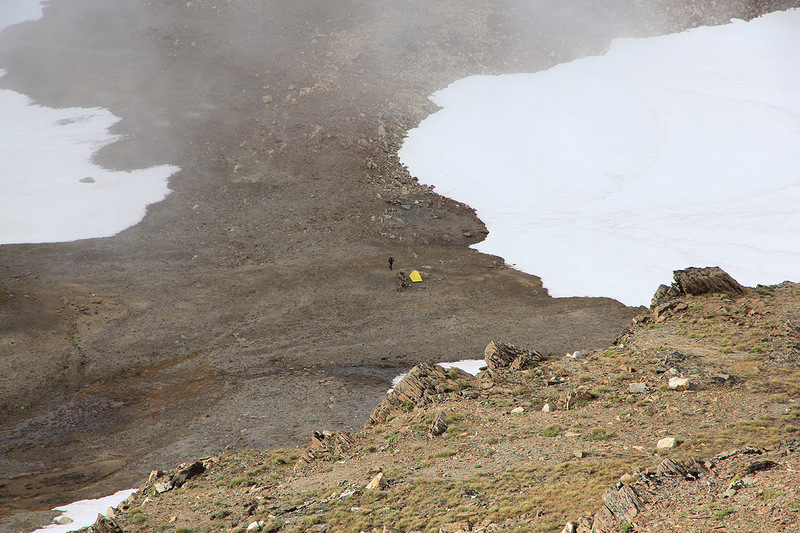 The next section of the route is fairly flat, however, the maps (2010) shows the White Chuck Glacier which has completely vanished (melted away). Thus, the map and the terrain may not always match very well. Continue essentially along a straight line course (with obvious local modifications) to location N48:04.186, E121:06.990, elevation about 2030 meter (6660 feet). You are now near a loose moraine. Start climbing uphill from this point. You may find a long snow slope or end up following a small creek. Continue uphill until you reach the side of a local plateau. There are a couple of cairns here. 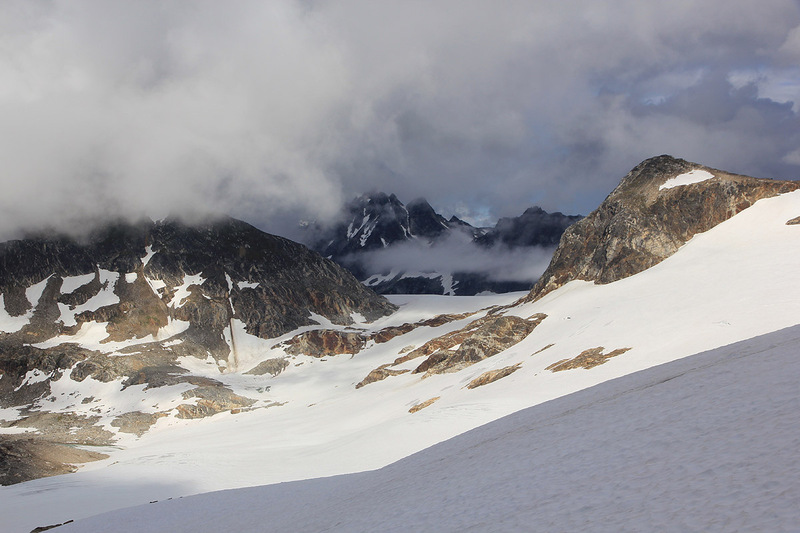 From here, you can see the clear saddle between White Chuck and the Suiattle Glacier further east. Stay on the right side and you will pick up a faint trail ascending (between rocks), the final stretch to the saddle. This saddle is at location N48:04.584, E121:06.297, elevation about 2220 meter. 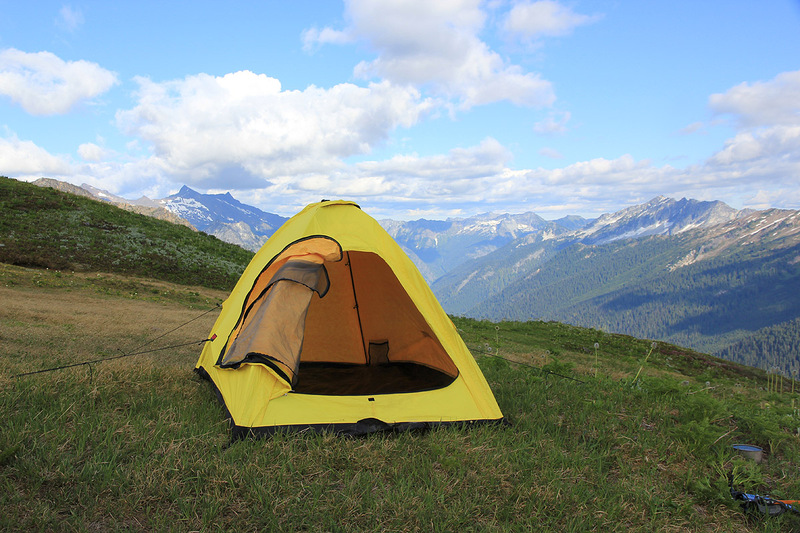 This is also a good place to camp. From this key saddle, the best route heads north, on the west side of the local top to the north, gaining the col east of point 7739 (2359 m). Descend north a bit more steeply, to the glacier below, then continue on the glacier, staying left, but contouring quite a bit in order to gain the lower part of the glacier slope that climbs directly towards the Cool Glacier on the east side of the (south) ridge leading up to Disappointment Peak. The map is not showing the glacier very accurately any more due to substantial glacier melting. Our route went via N48:04.990, E121:06.470, elevation 2229m (7313 feet), then contouring and gradually climbing to location N48:05.763, E121:06.276, elevation 2425 meter (7956 feet). From this location, one can proceed more or less directly uphill. 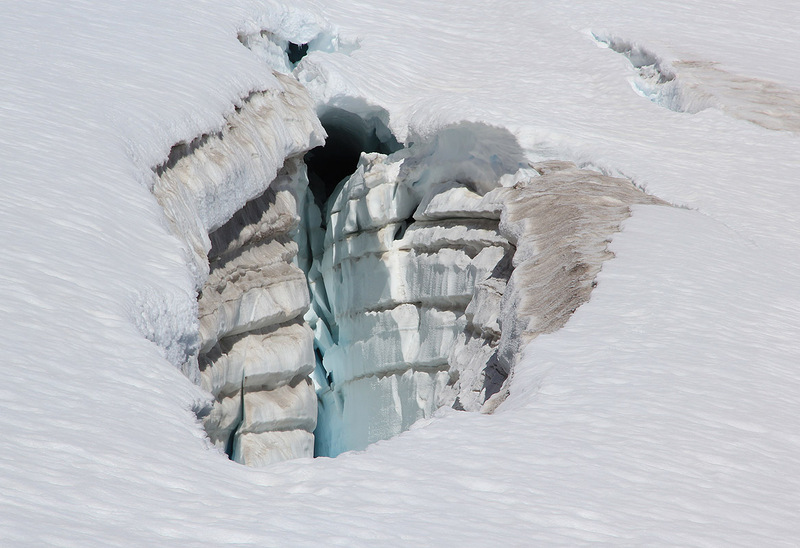 There are few crevasses. Near the top of this glacier at location N48:06.315, E121:06.406, elevation 2755 m (9040 feet), one should see the somewhat more crevassed area forming the transition to the Cool Glacier. We passed through this area roughly in the middle going up and took a path somewhat higher (more west) when descending. 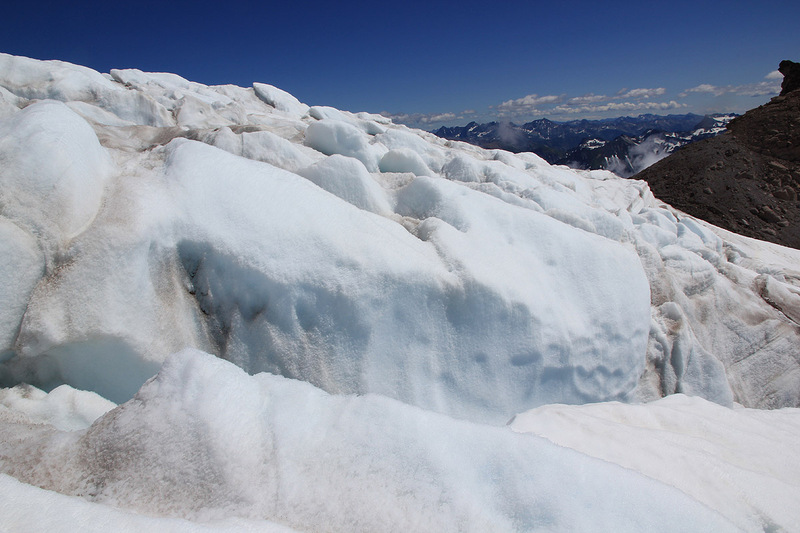 The Cool glacier has more significant (lateral) crevasses, the best route runs uphill along its south side. 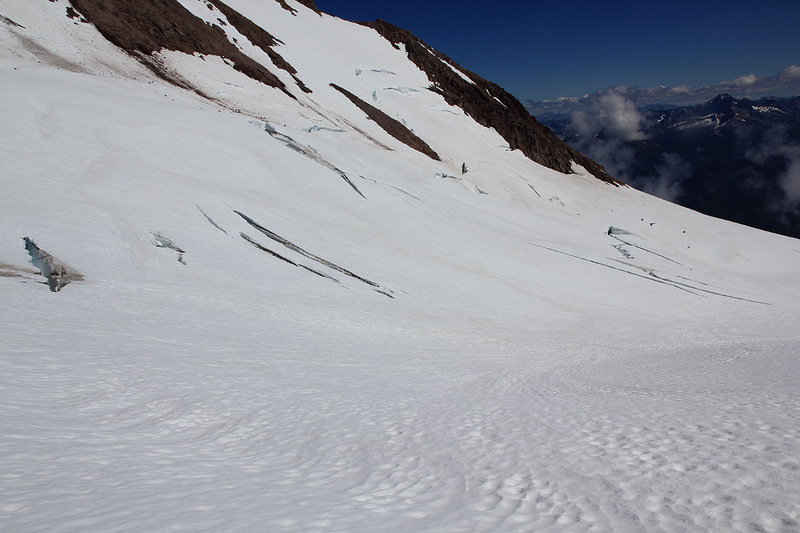 That is, as soon as one has cleared the crevassed area between the two glaciers, turn left and proceed uphill. 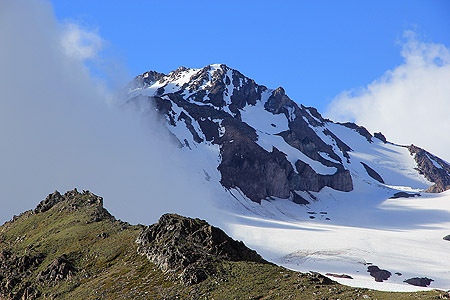 You will then gain the very distinct (moraine) ridge connecting Glacier Peak with the lower Disappointment Peak (2973m). 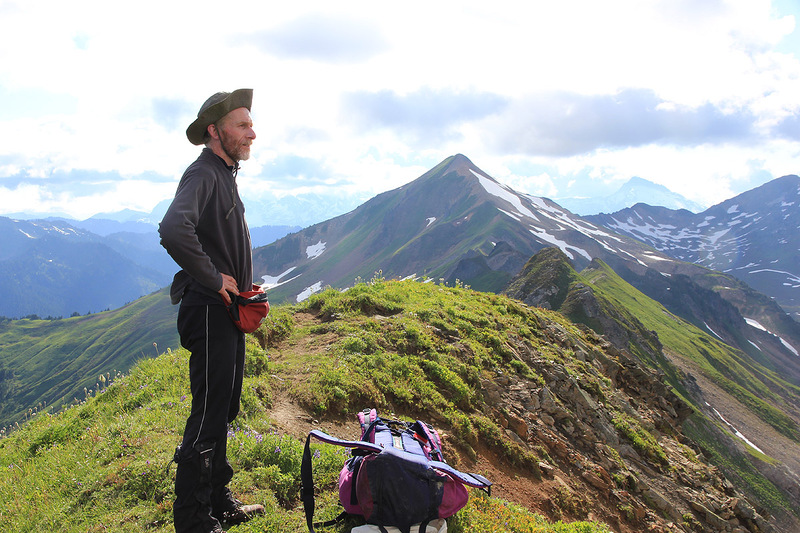 We made the ridge at location N48:06.424, E121:06.802, elevation about 2950 meter. Follow the ridge until it ends, traverse slightly left (climbers trail) to gain the final snow slope at about 3100 meter (10170 feet). Follow the snow slope uphill to gain a small shoulder, turn slightly more right and continue directly up to a small saddle beween the two summit points. 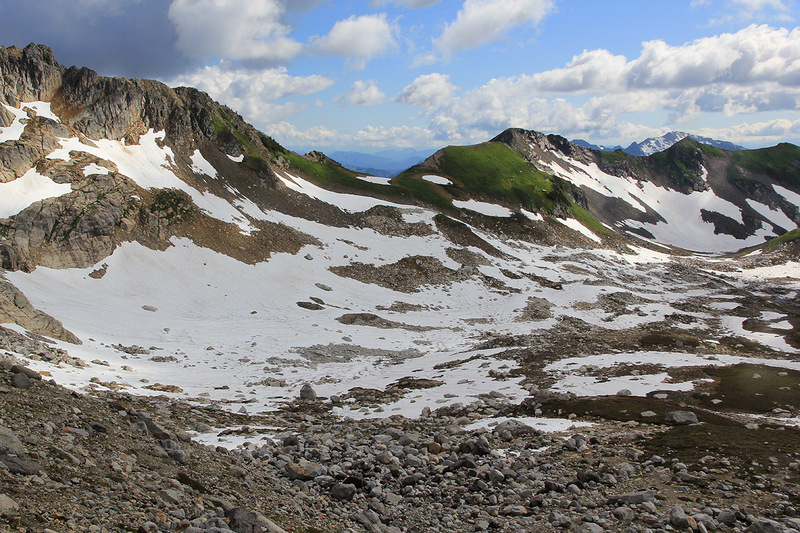 The left (west) summit is fairly distinct and rocky, while the rounded snow summit slightly further east has no visible rocks. They appeared pretty equal in height when we visited. This was our first summit on what turned out to be a trip visiting 8 ultra prominent mountains in the North-West USA. I picked up Rob at the Seattle airport on Monday, August 9th., having arrived a few days earlier and established HQ in the home of my very good friends Loyce and Randy. Approach: We drove directly to the trailhead, arriving there around 7PM. We slept in the car and were ready to go at first daylight, 0530, on August 10th. It took us about 2 hours to reach the Mackinaw Shelter. 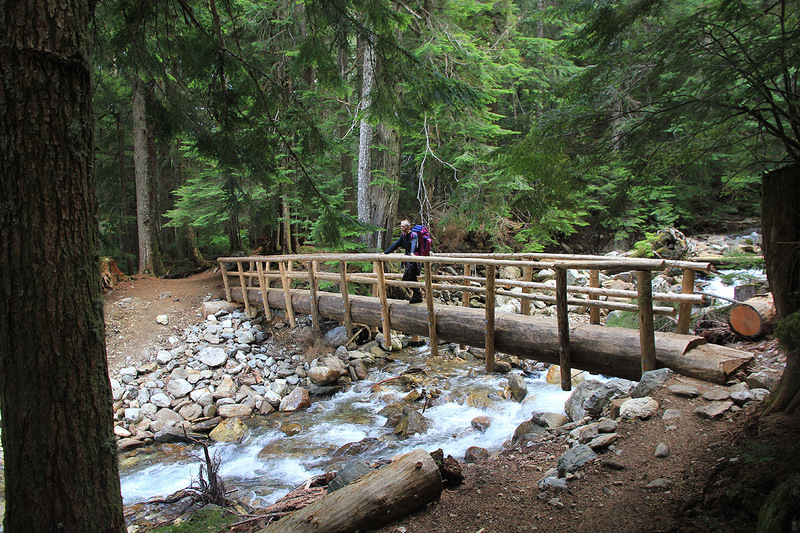 The trail is very well maintained and a newly constructed bridge made the crossing of Red Creek easy. 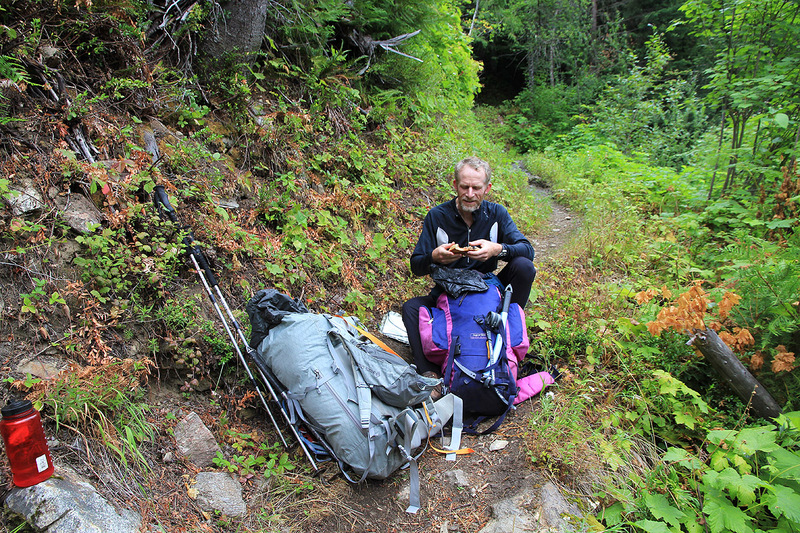 We felt the backpacks a bit more in the ensuing uphill, but overall progress was good and we reached the PCT in about 4 hours followed by the 2063 meter summit about 6 hours after starting out. The weather had turned into mist and fog and visibility was poor. We followed the ridge across the next summit and into the upper part of the basin below. A short scramble among boulders led us to the top of the moraine hill. (Note that it is better to keep right of this hill, see the route description.) 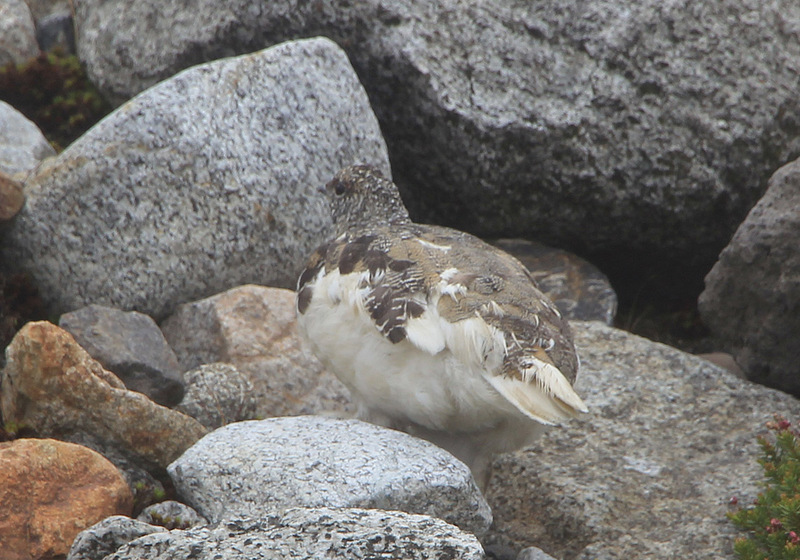 Among the rocks going up this hill, we came across several ptarmigans, seemingly not very worried about our sudden presence. The rest of the day was slightly confused as the visibility got quite bad, our route ran extremely close to the interface between two separate topo-maps and the glacier that was supposed to be here had obviously melted, leaving behind a lot of loose material as well as features that failed to show on the map. 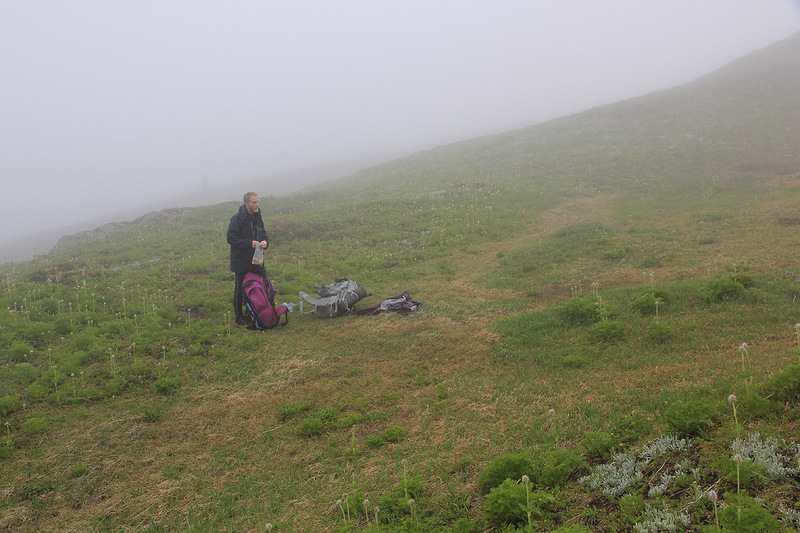 With the added effect of fog making every feature appear bigger than it really is, our progress was slow, but steady and we arrived at the main saddle at 1445, 9:15 after leaving the car. It was time to make camp and cook dinner. The fog liftet in the early evening and Rob went on a scouting trip to the next col on our route, while I enjoyed a nice and easy scramble up the ridge leading south. 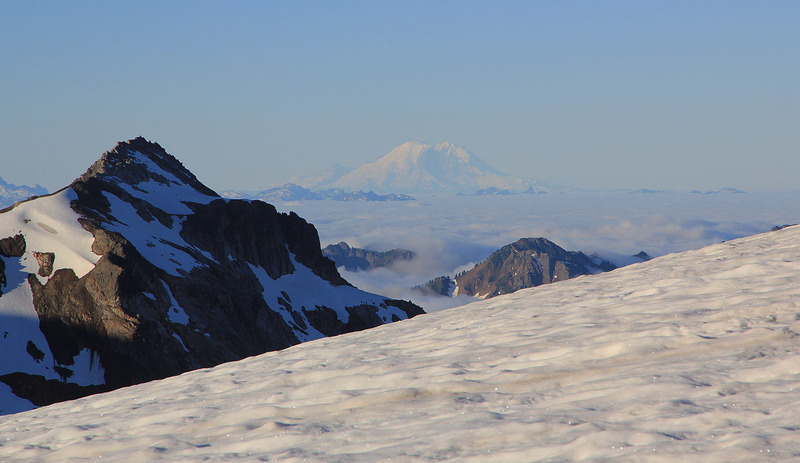 I attained a local summit (elevation approximately 2335 meter), from where I had a very nice view of the rugged summits crowning the southern rim of the Suiattle Glacier. I was also able to catch some limited views of Glacier Peak. 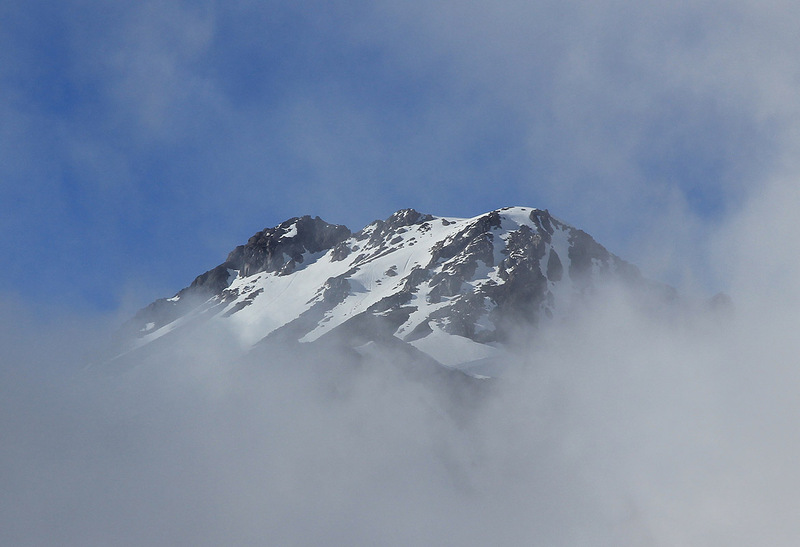 The clouds were drifting and the peak looked quite challenging from my vantage point, partial views but never the entire mountain. We were quite happy with the day and went to sleep hoping that the weatherforecast would still hold, good weather had been "promised". 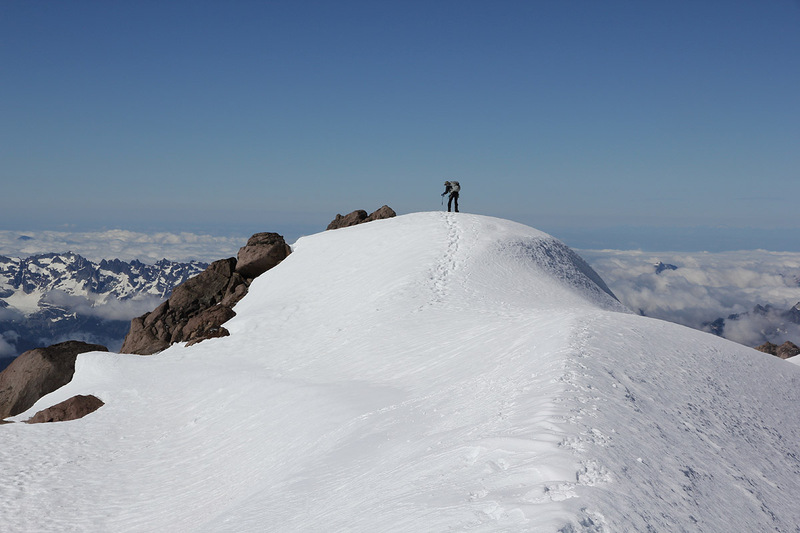 Summit Climb: August 11th. dawned with a red light across the eastern sky and the last stars vanishing above us on a dark, clear cloudless sky. We had (hot) breakfast and were ready to set off by 06:45. 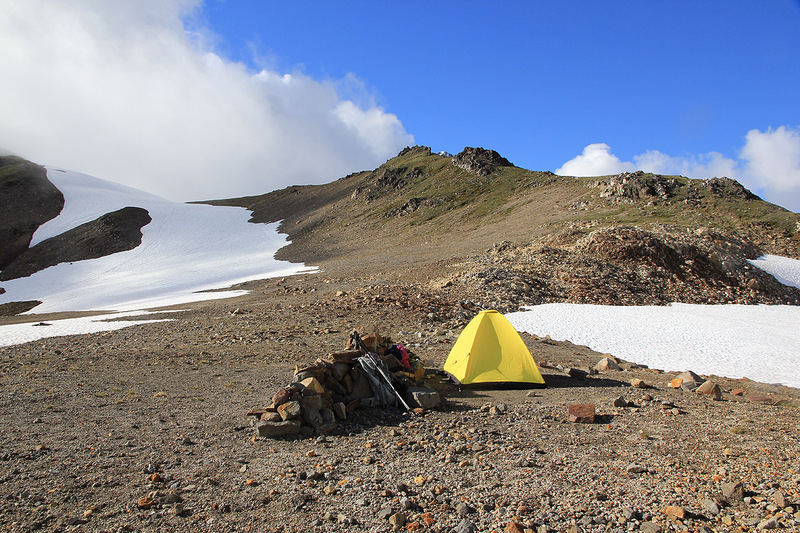 The snow was hard and crusty, crampons were needed already to scale the snow slope that started just beyond our tent. In fact, the tiny creek that we used for water supply the day before had frozen up during last night. 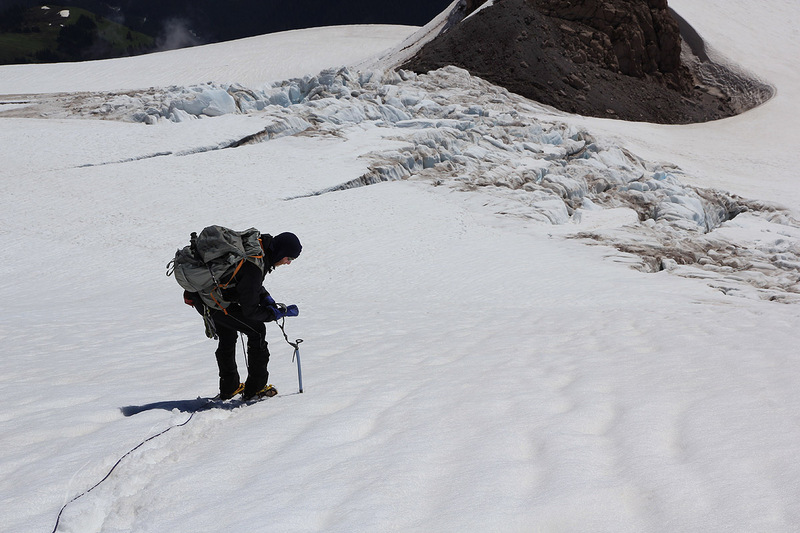 Descending to the main glacier, we roped up early since crevasses were spotted right from the beginning. The terrain was characterized by several ridges before we could gain the main slope. We ended up finding a good line that led us up to the final slope without much loss of elevation. 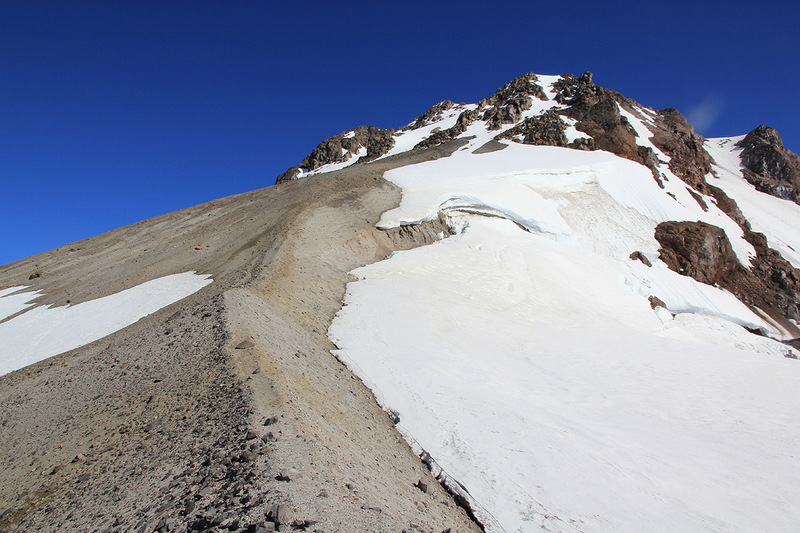 We rested briefly at the upper end of this main slope of ascent around 0900, before Rob found a way through the short, but crevassed cross-over to the Cool Glacier. The rest of the climb was very nice, but pretty straightforward and we ascended the final snow slope leading to the rock summit by 1015, 3.5 hours from camp. 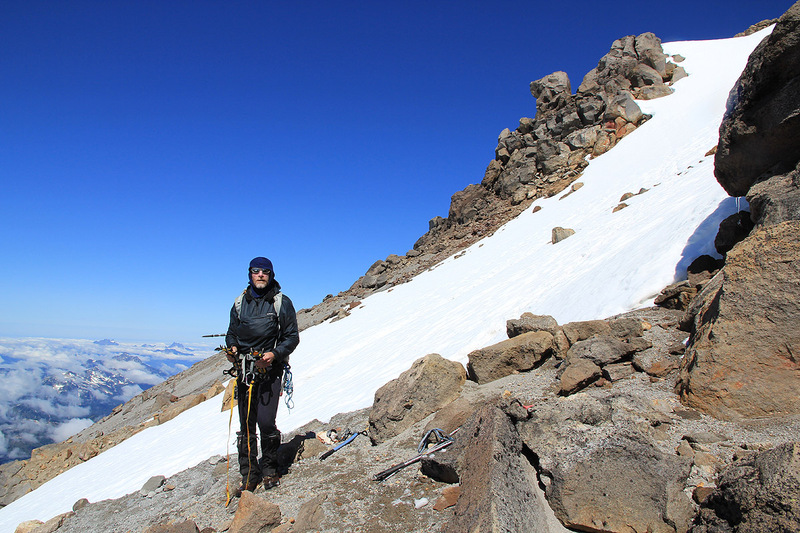 A very nice summit, the view underscores the wilderness experience of this climb. We had not seen a single person since leaving the trailhead. Peaks and valleys scattered in all directions. 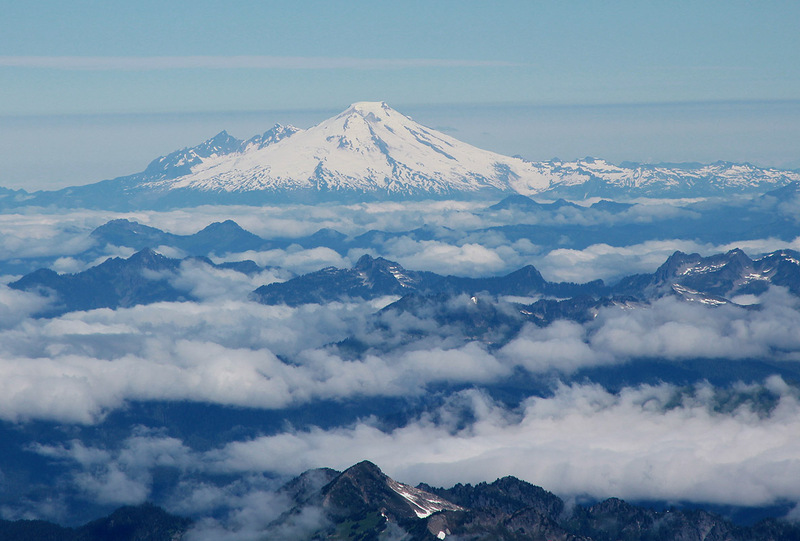 Mount Baker and Mount Rainier easily recognizable, bigger than anything else. We spent 30 minutes visiting both summits and enjoying the privilege of being just there. The sun was blazing, but a cold breeze offsetting, eventually it was time to retrace our steps. We returned to camp in 2:30, taking a new, well deserved rest. The day was still young and we agreed that moving camp back down to where the trail ended would be a nice afternoon assigment. 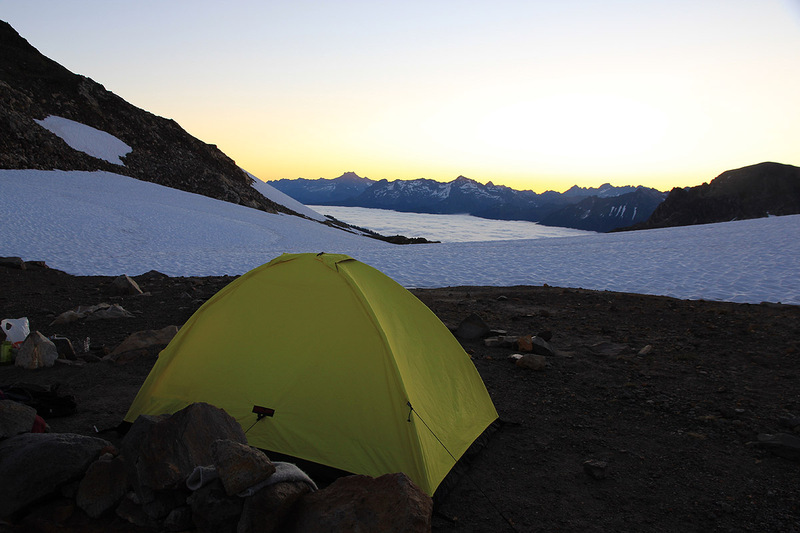 In this way, we could hike out in the early morning and be back in our Seattle HQ by mid-day. Thus, we left again at 1445 and reestablished camp, this time on a nice grassy meadow, after 2.5 hours of walking. Our camp site was pretty ideal, water nearby, flowers all around, and a very nice view into and across the White River Valley. Our descent hike had been easy and obvious with good visibility. We had noticed a pretty big lake that we had not even seen on ascent. 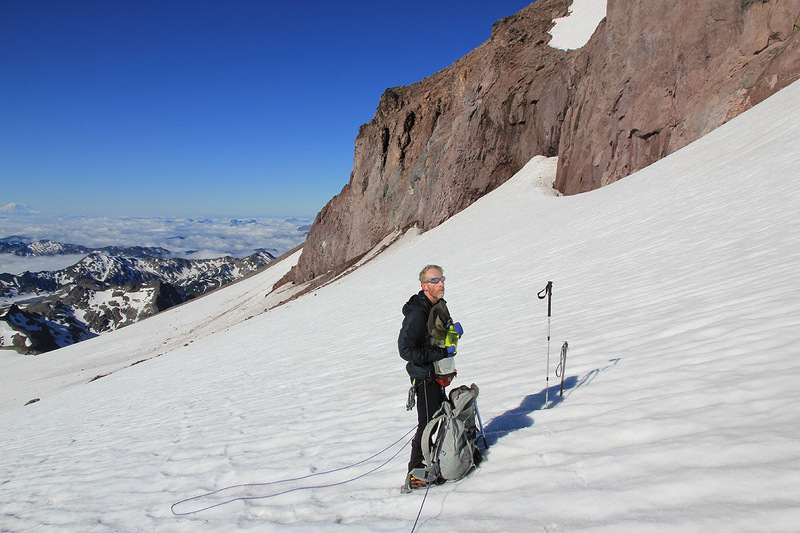 The "missing" glacier should make it a priority to update the topo-maps of the area. The route back to the dividing ridge was easy and obviously the best line. Having reached the nice ridge, a single fighter jet thundered above us, making a wide arc as it turned. The roaring noise felt foreign, a stark reminder of the outside world. We had enjoyed this wilderness, not a single hiker or climber besides us. On August 12., we left at 0615. 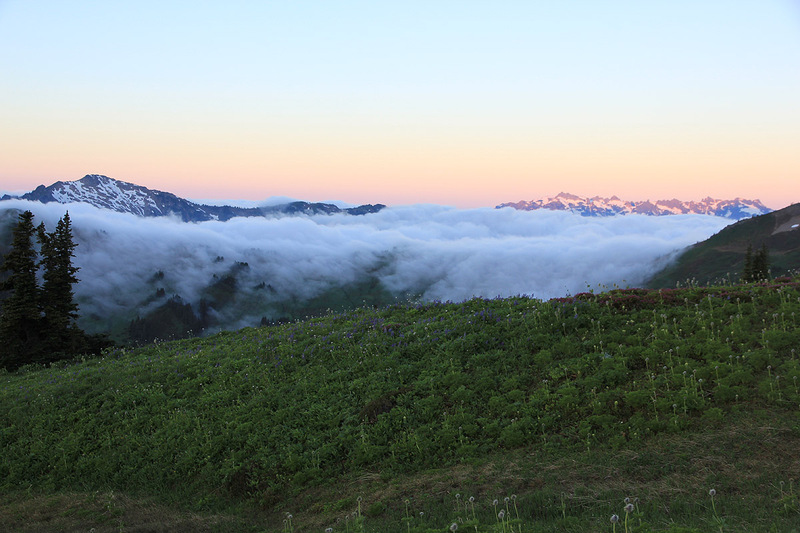 The valley was filled with clouds and they drifted around in lower lying areas. We reached the shelter by 0800 and estimated to be back around 1000. However, just 1.5 kilometer from the trailhead something suddenly snapped near my right ancle. Pain. I could only limp along and we reached the car by 1015, I was pretty concerned about what had happened. Totally without warning and on a flat and easy trail. In the worst case, this would put our trip in jeopardy. I had invited Rob to come along, now I was quite worried that this silly injury might cause his trip to be constrained by me. We had planned six more peaks and I could not even walk. We returned to Seattle mid-day and Ben helped locating a sports medicine clinic. We altered our plan (which was already Plan B), Plan C was conceived and approved. The next day would be transport only, getting us near Abercrombie Mountain. Our first mountain (and Rob's first mountain in the USA) had been a very memorable wilderness experience. We did not meet a single person, we walked about 45 kilometer with an elevation gain of about 2600 meter. The trip took 2.5 days and we experienced a full range of weather, from rain and fog to brilliant sunshine. Overall, there are few trips that can match this one - highly recommended! See also the nice picture story posted by Rob. The ridge route. 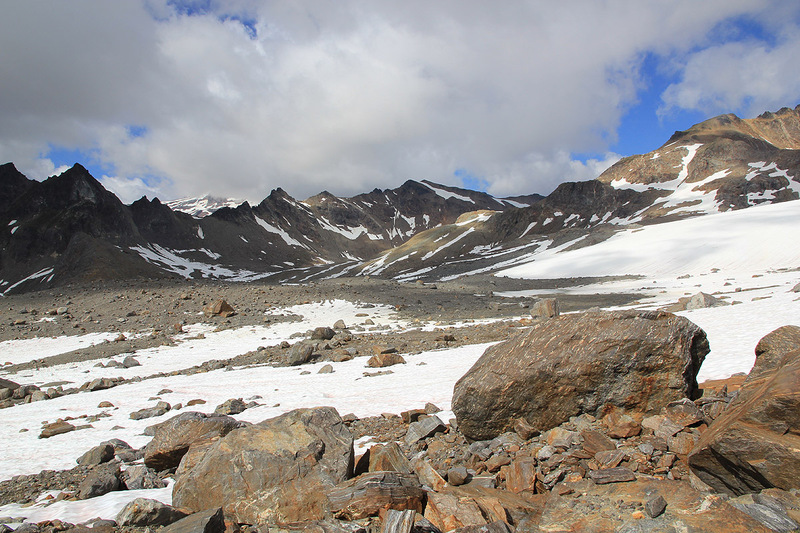 From the first peak, proceed to the second saddle, then descend on a traverse in order to ascend on the right hand side of the moraine top that can be seen behind the flat ridge. Rob on the ridge, this is the local summit. The route runs in the opposite direction. Descending from the ridge to where the trail begins. First light, the valleys are filled with clouds. 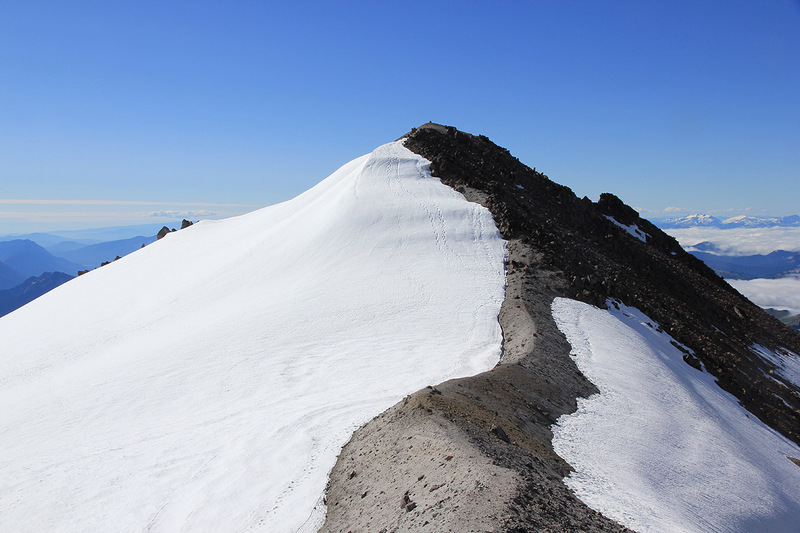 The route from camp first climbs this col.
Mount Rainier, as seen early on the summit climb. Great view, looking back while ascending the glacier. The moraine ridge connecting down to Disappointment Peak.